The sport of Schutzhund has it's origins at the turn of the century. In 1899, Captain Max Von Stephanitz Founded the Verein fur deutsche Scaferhunde, the original breed registry and breeding organization of the German Shepherd Dog. Schutzhund is a German word that means "protection dog". It refers to a sport that focuses on developing and evaluating those traits in dogs that make them suited for this sport. Schutzhund work concentrates on three parts. The first being tracking, the second obedience and the third protection work. 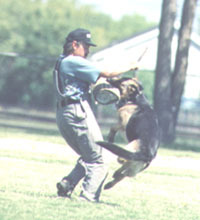 The Schutzhund standards for protection work, are similar to those for dogs in police work. While dogs of other breeds are admitted to schutzhund trails this breed evaluation test was specifically for the German Shepherd Dog. Schutzhund is intended to demonstrate the dog's intelligence and utility. As a working trail, Schutzhund measures the dogs mental stability, endurance, structural integrity and efficiencies, ability to scent, willingness to work, courage and trainability. SchutzhundThis working dog sport offers an opportunity for dog owners to train and compete with each other for recognition of both the handlers ability to train and the dog's ability to perform as required. It is a sport enjoyed by persons of varried professions. 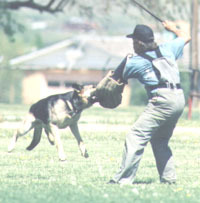 Persons of allages can compete- even those with significant disabilities can enjoy Schutzhund.